With SAB Bröckskes’ newly developed TWO in ONE Cable, manufacturers of drive units are now able to considerably reduce wiring effort while saving space, weight and cost. Until now in drive technique generally two cables were needed: a cable for the power supply of the drive and a transmission cable for the signal transfer to the control unit. The development of new digital transmission systems makes possible the use of the so-called one cable solution. With this, sensor signals and power supply is realised by a single cable. The one cable solution by SAB combines the two functions in one cable. The advantage for drive unit manufacturers is evident. Due to the use of only one cable the wiring effort is considerably reduced. Low weight and space saving are further advantages, especially for highly flexible applications; for example, in cable tracks. As an expert for special solutions SAB offers several one cable solutions, which have been tested in our own technical centre with regard to their capacity towards millions of bending cycles. 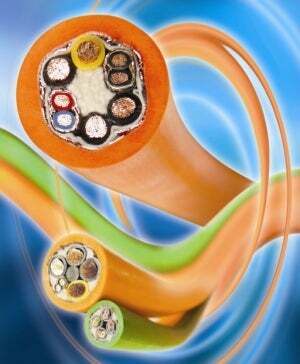 The TWO in ONE Cable will be presented at the AUTOMATICA exhibition from 3-6 June 2014. Visit SAB in hall B4 at stand 105 to find out more.